Gracefully the stallion gallops across the beach, sweat glistening off his cherry bay neck. 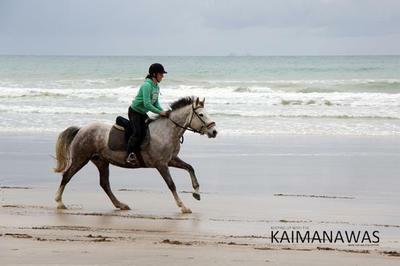 His hooves pound into the soft, wet sand as he lengthens his stride to match the dappled grey mare. The sun shines through the miserable grey clouds down onto them as tiny splashes of nippy sea water rise to meet the horses bellies. Sand rushes below their hooves like they’re in a race car going 200 kilometres per hour. “Come on Abby! I’m going to get to the Fish n’ Chips first if you don’t hurry up!” Sasha calls out to me from the dappled grey rump of her horse Marley. “I’m coming, I’m coming. I thought this wasn’t supposed to be a race,” I mumble to myself. I gently kick on my Kaimanawa stallion Sunchaser. He dramatically accelerates his pace and within a few seconds, we are about five horse lengths in front of Sasha and Marley. My long dark brown hair gently slashes across my olive coloured face as I laugh out loud. I heave on Sunchaser’s plush black leather reins to bring him back from a flat-out gallop to a slow canter. Dismounting, I lead him over to the array of fruits, sandwiches and of course, mouth watering Fish n’ Chips, set out on a faded red and white tartan rug next to Sharon, my beautiful Mother. “Great! I managed to get Sunchaser to do a flying change!” I reply excitedly. “Sure thing,” I agree, as Sasha and Marley trot in behind me. We lead our sweating horses to the top of the frost covered sand dunes where some old Pohutukawa trees proudly stand and tie the horses to the branches. As we stumble our way back down, I hear Sunchaser scream. “He must be wondering why we left him,” I think to myself. I plonk down on the rug and dig in, but as I started eating, I hear another scream, this time from Marley. I try to glance up at the sand dune to see what is making them scream but all I can see is sand. “Why do they keep neighing?” Sasha wonders out loud. “They've probably just heard another horse,” I say. “If you say so,” Sasha replies hesitantly.